VietNamNet Bridge - Low-cost airline Vietjet has announced that it will relocate its international flights from Terminal One (T1) to the new Terminal 2 (T2) at Noi Bai International Airport in Hanoi. The first flight to depart from the new terminal will be on Christmas Day, when flight VJ901 departs Hanoi for Bangkok at 1.10pm. Passengers should also note that check-in counters will open at 10.10am on December 25. As of 4am on December 31, 2014, all international flights operated by VietJet will relocate from T1 to T2 at Noi Bai International Airport. Accordingly, VietJet’s flight check-in counters will relocate from Hall E in T1 to counters numbered from 1 to 5 in T2. This new check in area, which will serve all of VietJet’s international flights, is designed with an ultra-modern layout and design and features a very visible sign system with the airline’s trademark logo and colors. The check-in area is also conveniently located by VietJet’s ticket counters to facilitate passengers purchasing tickets at the airport. The baggage claim area for arrivals plus the lost and found counter is located on the first floor. Furthermore, VietJet’s Skyboss lounge is on the third floor, where passengers flying with Skyboss can relax in an exclusive and relaxing environment. Counters for international flights will open three hours before departure and close 50 minutes before take-off. The time for transfer between T2 and T1 is about 10 minutes by bus. To ensure a safe, punctual and comfortable flying experience, it is advised that passengers take note of all flight times and airport procedures, such as customs and security measures, and arrive punctually, upon transfer of international flights to the new terminal. 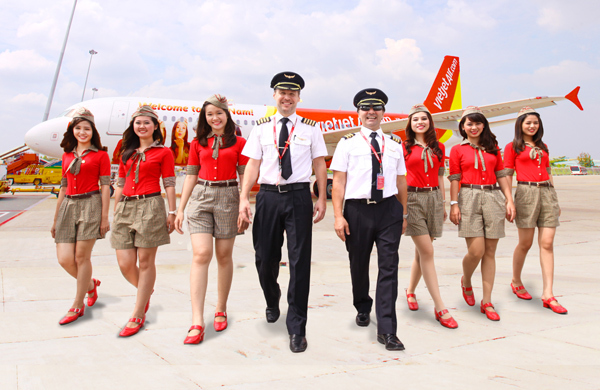 Regarding domestic flights, passengers will continue to depart from Terminal 1 and check in at Hall E.
The first privately-owned airline in Vietnam VietJet is applying the operation model of a new age airline. With the fleet of 19 Airbus A320 aircraft, it now operates 130 flights per day, transporting eight million passengers in total so far. The airline is covering 30 local and international routes across the country and the region to Singapore, Thailand, South Korea, Taiwan, and Cambodia. 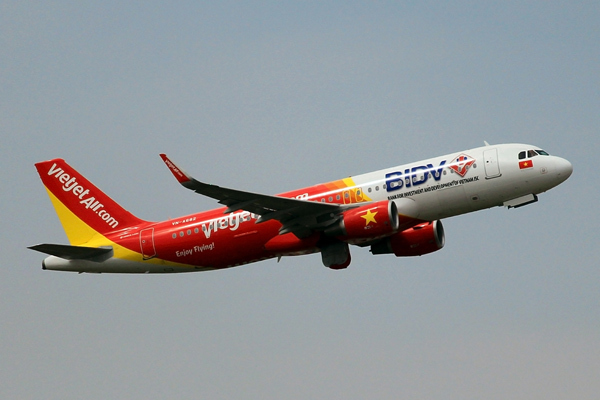 VietJet will take delivery of 6-12 Airbus aircraft every year. The airline will order from world-leading aircraft manufacturers new wide-body aircraft in order to launch international routes to Europe and expand the flight network across the Asia-Pacific region.